Iron comes from red giant stars. Helium in red giant stars turn into carbon and oxygen and then the carbon and oxygen form into iron. When the red star is mostly iron, it turns into a supernova and explodes sending oxygen, carbon and the heaviest element, iron, out into the universe. All the iron on earth is from stars. Iron is the sixth most common element on earth. It is the fourth most abundant material in our planet’s crust. It probably constitutes most of the earth’s core. It is in all living things, too. Iron in plants helps to pull energy from the sun into the leaves. Iron in people helps move oxygen through the body bringing energy. 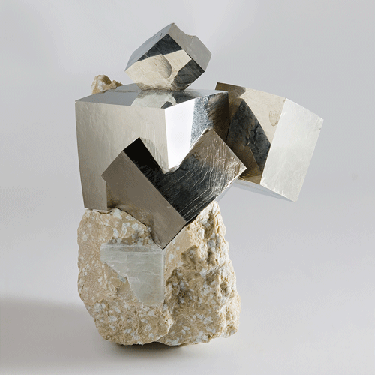 In its pure state (which is rare on earth), iron is bright silver. Iron from meteorites looks black but when paired with oxygen turns red. Iron rusts oxidize and changes colors when combined with oxygen or water (H2O). Iron as a material was a driver of the industrial revolution. Engineers designed cast iron bridges crossing rivers. Within a short span of time, carbon was added to iron to make stronger alloys, or combinations of metals, like steel. Railroad ties driven into iron rails forged metal highways across the country. Suspension and truss bridges spanned even greater valleys. Today, iron is the most frequently encountered metal in daily life. Iron from meteorites fashioned into beads has been found dating back to 3500 BCE. Some cast iron pans still in use today are from as early as the Han Dynasty in China (206 BCE). Cast iron pans are almost entirely pure iron, and you will feel the metal’s weight when you pick one up. Steel pots and pans contain small amounts of other metals and carbon to form an alloy and are not as heavy. Iron should not be confused with aluminum. Aluminum, atomic number 13 and the third most abundant element and most abundant metal in the earth’s crust, is a silvery-white, soft, nonmagnetic, ductile metal. Outside you may come across some rocks and minerals that contain iron such as pyrite (also known as fool’s gold), hematite (which is how commonly mined form of iron), or rust (of which there are several different types with colors varying from red to orange to black). Other forms of iron alloys include cast iron, wrought iron, and steel. 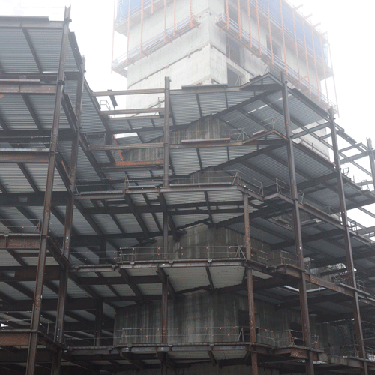 Today, iron is found in many different alloys, objects and buildings. Take a look at your appliances. Take a look at your car! Look around your house, your neighborhood, and your city and find at least ten different examples of iron and its uses. Make a word web about iron and its many applications in your life! Look up and find iron’s atomic structure. Draw and label its electrons, protons and neutrons. In the periodic table, iron is element 26. Its electrons are configured as 1s² 2s²2p⁶ 3s²3p⁶ 4s²3d⁶ or [Ar]4s²3d⁶. These refer to the energy levels of the atoms. Iron’s atomic structure makes it easy to combine with many other elements. The 4th electron shell has only 2 electrons, and these two, taken by other molecules containing 8 electrons, form an ionic bond. 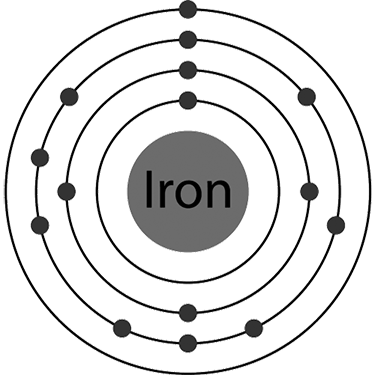 When iron rusts, Fe (the symbol for iron) reacts with O2 (oxygen found in the air or moisture) to create Fe2O3; the oxygen atoms steal the negatively charged electrons from the iron and become more negative making the iron atoms more positively charged. The attraction of opposites holds combinations of atoms together creating new molecules. Draw the atomic structure of iron. Iron is mined from the earth. When it is found, it needs to be separated from other substances. The process, discovered in by , is called smelting. Smelting is heating iron ore to a high temperature and then separating the iron form the other elements. 2. Iron is malleable (moldable)? 3. Iron is heavier than aluminum. Iron is used mostly as an alloy. Iron was used extensively during the Industrial Revolution because of what factor? It was found in China.